1996. Nijel BPG, sculptor. Assistant sculptor: Jean Cherie; molds: Reije Andersson Fine Arts Studio; foundry: Artisan Bronze; engineer: Mike Ishler; landscape: Joe Addo Studios. 10950 Central Ave, Los Angeles. 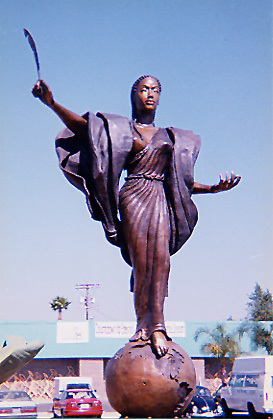 The image of this 16 foot bronze sculpture is included here courtesy of the artist, Nijel BPG. Additional information about the sculpture may be found at the Mother of Humanity web site. The Mother of Humanity(TM) name and related images are trademarks of Nijart International. All rights reserved. following the April 29, 1992 Los Angeles Rebellions. to exemplify the cultural diversity of the world's new universal mother. at the Watts Labor Community Action Committee in Watts. Africa, Australia, Brazil, China, India, and Spain."